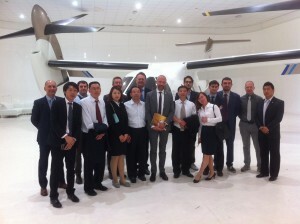 Italian Aerospace Network warmly welcomed a delegation of AVIC (Aviation Industry of China) Enterprises to Italy from June 17th to June 22nd 2015. AVIC trips to Italy aims at strengthening the bi-lateral commercial and economic relationship between Italy and China, signed by the Prime Minister Matteo Renzi and Premier Li Keqiang in Beijing in June 2014. The two countries, linked by the “Sino-Italian Cooperation Agreement for the Aviation and Aerospace Industry”, are working hard in order to match the offer represented by the Italian Enterprises with the demand of the Chinese booming industry. On one side, Italy hosts over 1400 SMEs that vertically support the whole industrial supply chain both domestically and internationally. China, on the other side, is going to represent the first global market within 2025 in the aviation and aerospace sectors. Italian Aerospace Network, through its own project named “Sino-Italian Aerospace Platform” aims at connecting and improving the two Countries’ relationship within the industry as a no-profit Association of Italian Enterprises with both offices in Italy and China. The Delegation, composed by AVIC Guizhou Liyang Aero-Engine Co. Ltd., AVIC Optical-Electrical Technology Co. Ltd., AVIC CanNews Co. Ltd., AVIC Engine Co. Ltd., AVIC Aircraft Co. Ltd. and AVIC Luoyang Institute of Electro-Optical Equipment Co. Ltd., represents an important part of the Chinese aviation industry and travelled to Italy from different areas, such as Beijing, Henan Province, Sichuan Province, Guizhou Province and Shaanxi Province. The AVIC Delegation had the opportunity to visit the Headquarter of Italian Aerospace Network (Gallarate, Varese – nearby Milan Malpensa Airport), to meet Italian officials and Government representatives at the Gallarate Modern Art Museum (MAGA), to visit Agusta-Westland and finally meet several Italian enterprises and institutions at Volandia, the first art-place for historical and contemporary aviation inside Milan Malpensa Airport. Italian Aerospace Network organized a highly efficient and target oriented trip to Italy for the AVIC delegates, who obviously had the chance to enjoy some cultural and lifestyle tastes of Italy as well, which is still recognized to be the hometown of technology, innovation, food, fashion, architecture and much more by our Chinese friends. Italian Aerospace Network warmly greets all of the Partners and Institutions that made this trip a real success in the history of bi-lateral relationships between Italy and China.